A couple weeks ago I looked out our bedroom window and saw a FOREST of weeds in our "backyard." Like seriously it grew overnight. I was shocked and since then it's just gotten bigger and bigger and bigger. 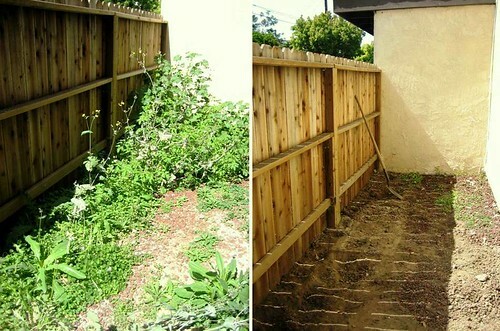 One of the things my family did together often when I was growing up was yard work/gardening. And today I finally decided to put all those years experience to good use and got to work on our weed forest. It took me 4 hours to clear it all out and my back is kind of killing me now (totally worth it though). P.S. I saw the biggest weed I've ever seen in my entire life. It was seriously the size of my WRIST coming out of the ground...like a small tree. So creepy.